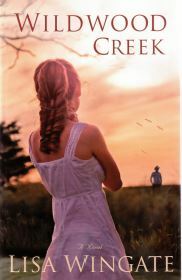 Wildwood Creek by Lisa Wingate (Bethany House, a division of Baker Publishing Group, Minneapolis, Minnesota (c) 2014 Wingate Media LLC. The premise of Wildwood Creek is interesting and original. Allie, a college student with dreams of being a film maker, takes a summer job on a set that promises a unique experience. A real-action recreation of a Civil War town and the strange, unresolved disappearance of its population, is interwoven with the college student’s story line. Allie ends up being cast as the school teacher of the town as re-enactment shifts into high gear. Romance and danger flit between the two time periods, and a mystery unfolds. Lisa Wingate writes with ease and grace. Her characters are believable and events well-paced; the suspense is alluring. The only down-side to the story line is that the author ends it with planned sentimentality rather than allowing it to unfolding with complete integrity. Wingate demonstrates insight into people and their development through their faith, making it attractive to Christian and non-Christian readers alike. This entry was posted in God walk by Larus Press. Bookmark the permalink.